Welcome to my Slow Miracle Art Store page! 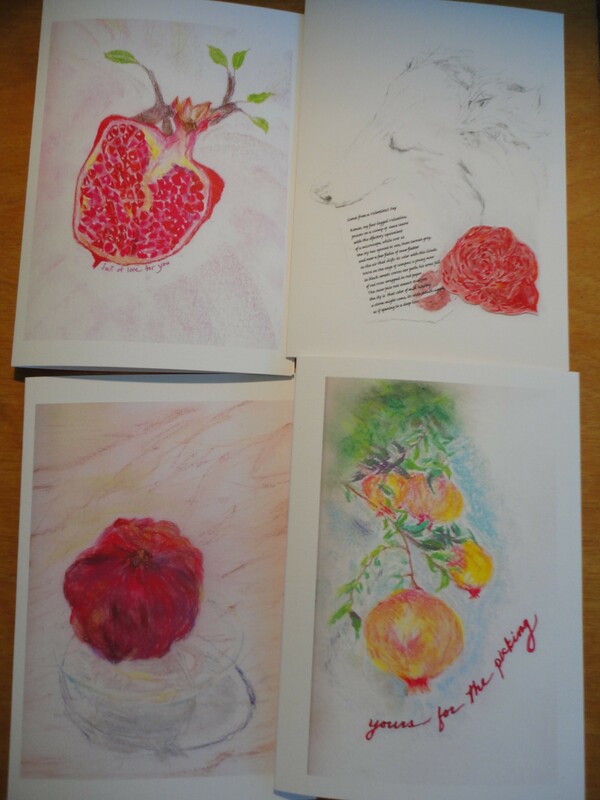 I’ve created an assorted 5 pack of art quality greeting cards from the illustrations my readers have enjoyed in my blog posts, and added a couple of seasonal paintings as well. I hope you like the cards. You can write your own messages inside, and spread the Slow Miracle sense of wonder with those you love. in the air that shifts its color with the clouds. of red roses wrapped in red paper. as if opening to a deep kiss. Pack of 4 I Love You cards includes one of each. $16 | $5.50 shipping and handling (domestic) for 1 pack, $7.00 for 2 packs, $14.00 for 3 or more packs. International shipping is $14.00 for 1-2 packs. 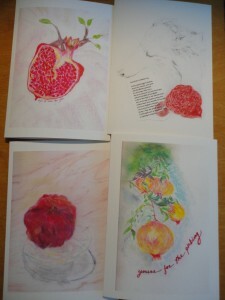 4 printed 5 x 7 greeting cards of original watercolors and mixed media drawings by Maria Theresa Maggi. Blank on the inside so you can write your own message. 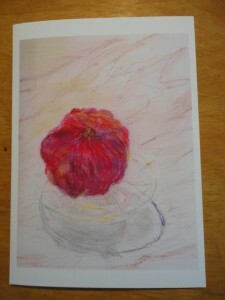 Some are illustrations that go with blog posts, others are new seasonal paintings. Printed on high quality card stock by Archer’s Printing in Moscow, Idaho. Each card comes with a matching envelope. Set is packaged in water resistant envelope and mailed in a stiff mailer or small box. Goes with blog post “Listening to the Earth” and is original illustration for the banner on Plant-Based Slow Motion Miracle blog. All back in Stock. 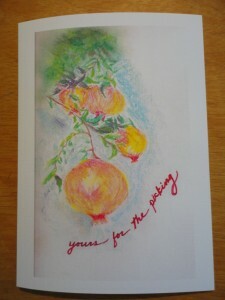 Many more card designs available from illustrations on the blog. Contact me for details to customize your order! Assorted Pack of Four $16 | $5.50 shipping and handling (domestic) for 1 pack, $7.00 for 2 packs, $14.00 for 3 or more packs. International shipping is $14.00 for 1-2 packs. 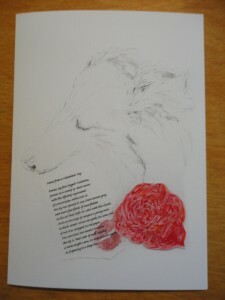 Winner of Second Honorable Mention in the 2012 Open Poetry Chapbook Competition at Finishing Line Press. 25 sonnets with a Winter to Spring feel. Original watercolor on the cover is also by Maria Theresa Maggi. 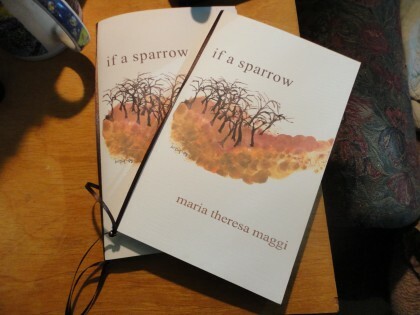 “If A Sparrow” $10.00 | shipping and handling same as the cards. 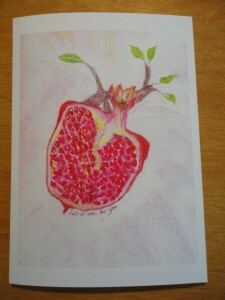 5 x 7 fine art quality framable prints of Slow Miracle Card Art. The “Add to Cart” button will place “Listening to the Earth” in your order by default. If you want “Ballerina,” “Moon, Tree Branch,” “Palouse Rainbow,” or Stove Glow 2″ as a print, specify which one(s) you want in the “Instructions from Buyer.” If you want more than one, choose your quantity and specify which ones in the same “Instructions from buyer” section as you check out. I’ll e-mail you and confirm your choices. All prints mailed in stiff mailer. 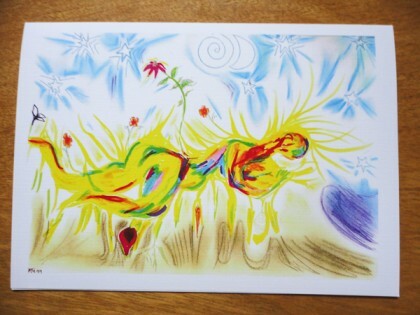 “Listening to the Earth” Print $16.00 | Domestic and International shipping same as cards above.